You don’t have to leave the Bay Area to find a magical setting for your big day. Finding the perfect location for your wedding and reception is one of the biggest pieces to the wedding-planning puzzle. Many couples choose to stay local — whether for planning purposes or to avoid a lot of travel for guests. Fortunately, the Bay Area has plenty of timeless, romantic locales where you can tie the knot. Though a museum probably isn’t your first thought when compiling your wedding-site wish list, one can be an unconventional and dramatic backdrop for your ceremony. The new Asian Art Museum of San Francisco marries modern elegance and classic Beaux Arts style. The historic and regal building, which was built in 1917 and used to house the City Library, provides a grand setting for weddings. Italian architect Gae Aulenti, the mastermind behind Paris’ award-winning Musée D’Orsay, transformed the library into the magical museum it is today. Huge windows and archways made of Travertine, a type of Italian marble, give the museum a truly majestic feeling. There are multiple options for your ceremony and reception, including an elegant sit-down dinner with dancing in Samsung Hall, which used to be the card catalogue room, or a more contemporary party in the North and South Courts. Whichever space you choose, guests can enjoy the world-class collection of Asian art. A nearby underground parking lot makes a large city wedding much less stressful. The 100-acre winery, just 45 minutes north of the Golden Gate Bridge, offers magnificent pastoral views. Many couples choose to exchange vows beneath the enormous oak tree with the Cabernet vineyards and Sonoma Mountains behind them. More than a dozen 130-year-old French Picholine olive trees and a huge, level lawn that’s perfect for receptions make up the Olive Grove. The winery also offers festive, countryside carriage rides for guests. If you love the vineyard atmosphere, but you don’t want to trek all the way to Wine Country, check out Byington Vineyard and Winery. Set in the Santa Cruz Mountains, the stunning Estate Pinot Noir vineyards make a great location for wedding receptions. A rose-lined brick walkway leads to Wedding Hill, where vows are taken beneath a jasmine-covered gazebo. Surrounded by evergreens, oak trees and flowers, guests will enjoy an amazing panoramic view of the mountains with Monterey Bay in the distance. The facility can accommodate 150 to 250 guests, depending on the season. If you and your fiance have an affinity for the ocean and you’re willing to venture a bit beyond the Bay Area, then the Monterey Plaza Hotel & Spa is the venue for you. Set on the water’s edge, the plaza boasts a spectacular view of Monterey Bay. Two bayside terraces are a splendid choice for an elegant and romantic wedding ceremony. Most receptions are held in the ballrooms, with floor-to-ceiling windows. The hotel has recently been renovated and features Mediterranean-style furnishings and advanced audiovisual capabilities. 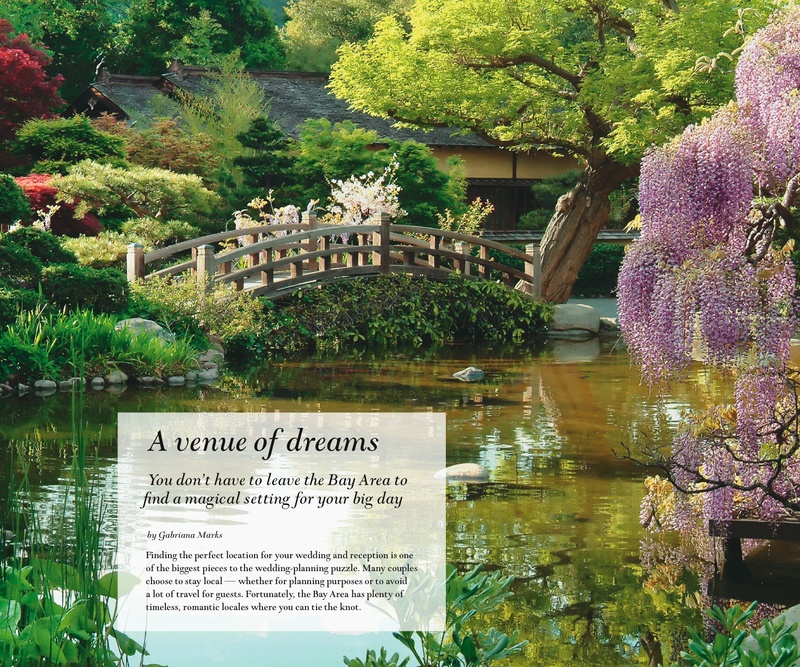 Hakone Gardens is the perfect Bay Area location for those who want a wedding exuding tranquility, peace and harmony. With 18 acres of beautiful nature and historic buildings, Hakone Gardens is the oldest Japanese-style estate garden in the Western Hemisphere. Hakone Gardens was founded by San Francisco art patrons Oliver and Isabel Stine and is now maintained by the nonprofit Hakone Foundation. If you and your fiance are golfers or if you just like the sun-drenched desert feel, then Sunol Valley Golf Club is the spot for you. Perfectly groomed golf courses, shining lakes and desert palms evoke a private, country club feel. Unlike many other local venues, Sunol Valley Golf Club can comfortably host 1,000 guests. There are endless possibilities at this serene setting, no matter the size of your bash. The Pavilion Room, great for large receptions, boasts floor-to-ceiling windows, balconies and a gorgeous view of the greens and the palms. And of course the golf courses are available for a round or for a photo shoot against the brilliant verdancy. 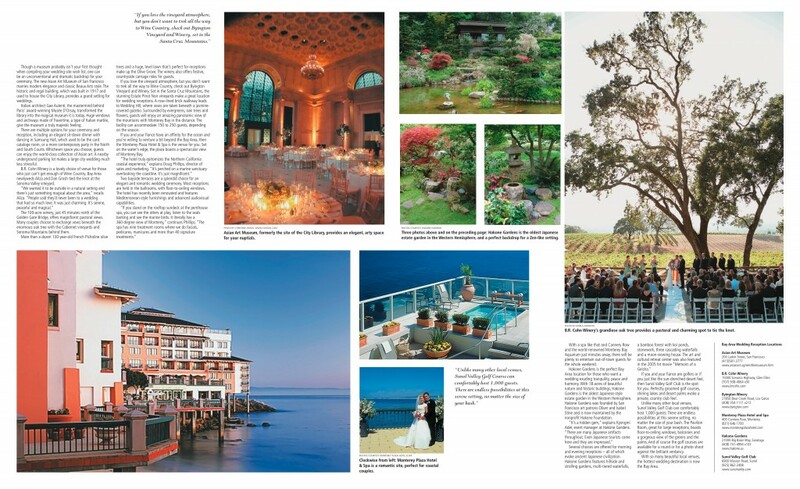 With so many beautiful local venues, the hottest wedding destination is now the Bay Area.